Don’t forget about the joy Christmas brings—Mary’s Heart makes our hearts merry. Our lives are inundated with so much chaos and mayhem, that we lose sight of the joy of living. Don’t allow the cacophonous noise to prevent you from rejoicing in the awesome gift God has bestowed upon us, His Son Jesus who brings immense joy. As you celebrate the birth of Jesus, remember those who may experience sadness because of the loss and memories of loved ones. Pray for their joy to strengthen them as they remember with gladness and not sadness. Find joy in celebrating with family and friends. These are the precious moments of time that makes our hearts merry. These are priceless times to cherish and share as you pass on memories and traditions to instill the commitment to family. Reach out to those who are alone in bringing joy to their day. 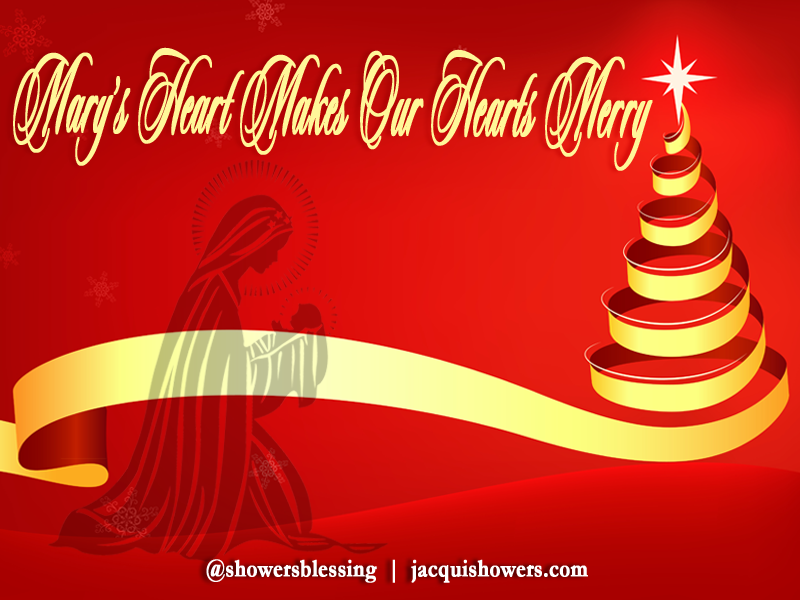 Mary’s Heart makes our hearts merry with the excitement and expectation that Christmas brings to each of us. Enjoy your Christmas and commit to bring joy to someone else as you spread the merriment of Mary’s Heart. Celebrate the joy of the season as your heart enjoys its merriment.